For most online businesses, particularly ecommerce stores, December tends to be the busiest and most profitable month of the year. With a huge number of businesses competing for Christmas, Boxing Day and New Year sales, it's vital that your marketing campaigns are as optimised as possible. To accurately determine which of your marketing campaigns is working the best for your business, it's important to know which is bringing you the most leads. Here's where we introduce your new favourite campaign tracking tool: the UTM tag. UTM tags are an easy, quick and free way of tracking every link your business sends out. In this step by step tutorial, we'll show you how you can add UTM tracking tags to your marketing campaigns without needing any previous experience or help from a web developer. First, let's start with the URL of the landing page you're wanting to use. Each time you use a UTM tag, you simply add text on to the end of your chosen URL. Once you know which URL you're going to use, add a question mark (?) at the end of the URL to show the start of the UTM tags. Campaign Source (utm_source) - this is used to show where the traffic came from, e.g. AdWords. Campaign Medium (utm_medium) - the medium shows what form of marketing it came from, e.g. Newsletter. Campaign Name (utm_campaign) - easily identify which specific campaign the traffic came from. Campaign Term (utm_term) - generally only used in paid search to show specific keywords. Campaign Content (utm_content) - this tag is helpful when testing specific content features, e.g. a link on a logo and a link in the text of the same page. With each tag you choose, follow it with an equals sign (=) and add your chosen text. Add the tags after the ?, joining each tag with an ampersand (&). Only use each tag once per instance and remember to only use an & to join tags; don't add them to the start or the end of the URL. Need more help generating your UTM tags? Google's free and easy to use Campaign URL Builder tool takes the hard work of putting your UTM tags together on your URL and is perfect for beginners. Simply add in what you'd like your tags to say and the tool will put them in the correct format for you. 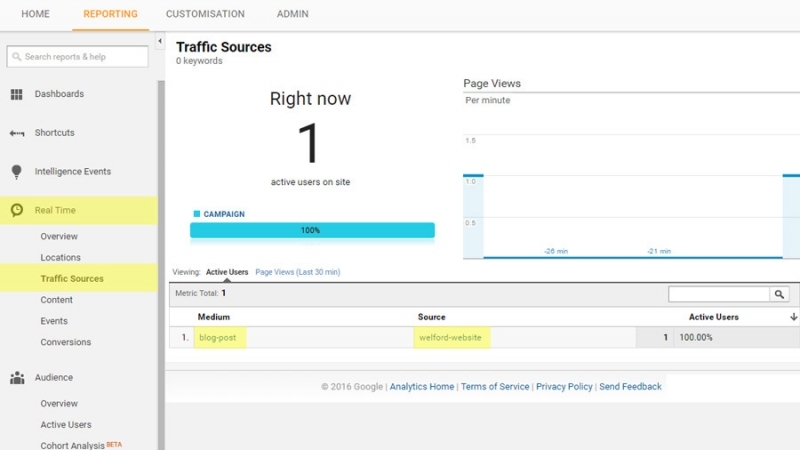 A quick and easy way to check if you've set up your UTM tracking tags correctly is to click your URL and check your real time traffic in Google Analytics. If you go to Real Time > Traffic Sources in your Google Analytics account, you should be able t see the Medium and Source which you've specified in your URL. UTM tags are the perfect free & easy way to keep track of all of your marketing campaigns. To find out more about ways to track your traffic and engagement, get in touch with our team.